My colleague Chris spotted a thread on a web forum about one of our services. The user was getting confused by a change in the presentation of the search function. Chris tracked down the people responsible for that bit of the user interface with a couple of detours to pillar and post along the way – and was told that everything was explained in the help text a simple click away. Chris was – quite rightly – not terribly impressed with that and spotted that the kind of usage the customer wanted could be illustrated very simply by adding it to the list of examples displayed with the search function. A couple of rounds of gentle persuasion and a week later and the change is done. None of this has anything whatsoever with what we pay Chris to do – so I am completely delighted that he did it anyway. But he is left with a question: should he now post a comment to the forum thread explaining what has happened? The fact that my answer was an instant and resounding ‘yes!’ is an indication of how far things have come; the fact that he felt the need to ask is an indication of how far we have to go. Presumably there’s a hope that it will make me feel better about Vodafone, or better informed, or just better. And in a way it did, but in another way it didn’t. A point to Vodafone for bothering to track and respond to critical comments, though half a point deducted for standing slightly too close. But the more serious problem is that all they have really told me is that they are listening – but not listening very precisely or to any great effect. London is a rather bigger place than Trafalgar Square. Are they acknowledging the existence of a Trafalgar Square problem, recognising a wholesale London problem, or referring to a small outage in Kilburn? There’s no telling. They are working hard, which is reassuring, but there’s no commitment to anything actually getting fixed. Do they have a problem with a mast sited somewhere over the head of the evil CIO of DCMS which can be fixed by a bloke with a screwdriver, or is their network saturated to the extent that they need to re-engineer their backhaul network, digging up half the streets in London as they go? And does any of that have anything to do with the complete deadspot on my journey to work which didn’t exist until a few weeks ago? It is transparently unreasonable to expect much, if any, of that to be addressed in 140 characters. The mistake Vodafone made was not that they didn’t overwhelm me with information, it is that my moan was about my problem, but their response was about their problem. Maybe there was nothing at all useful they could say about reception in Trafalgar Square at 5.47 yesterday – but if they had nothing to say, they might have been better off not saying it. So I tweeted. Although I know some of the Camden guys, I deliberately didn’t point it at them, to see what would happen. And now it’s fixed. In less than 24 hours. So, if you see something that’s easily fixable, do at least have a go at feeding back. It can work. Recognising problems in customers’ experiences and finding way to fix them is a superb way of demonstrating commitment to good customer service. I am delighted that Paul got so effective a response. I am delighted that Chris had the commitment and persistence to ensure that an effective response was given. 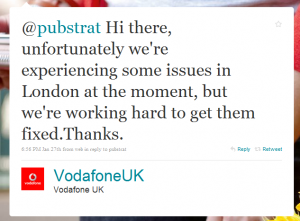 And I would still like to know if Vodafone are going to fix their blackspots.